Here is my long overdue circle lens review. These circle lenses were kindly sent to me by klenspop.com. This will be the first of two reviews. Klenspop's packaging is always so cute! The color is a pretty honey, grey brown. 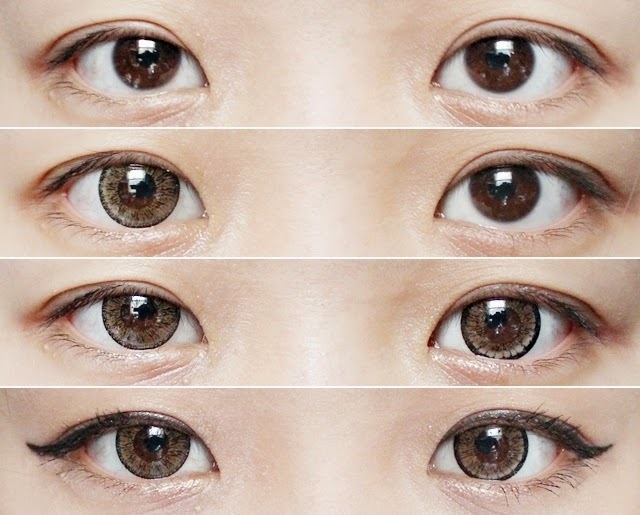 It reminds me lot of one of my favorite pair of lenses and ideally this is my favorite shade for "brown" lenses other than those that are almost exactly my eye color. I like how it naturally lightens my brown eyes. In most lighting, it will just appear brown, but in direct sunlight or maybe flash photography, it will be lighter. The design is interesting; it's similar to the Angel series, but with a thinner outer ring. It seems as though I received two different batches of these lenses which is why they look different in the photo above. I didn't even realize it until I was editing them. The black outer ring on the left (my actual right eye) is more faded. There is little to barely any enlargement for these lenses, but I gave it the full 5 stars because I love natural lenses like this. I have small eyes so lenses with a huge enlargement is just too overwhelming for my taste. Also, because it doesn't enlarge, I can wear little to no makeup and still look okay! Very comfortable. I wore it for the whole day (8+ hours). Love, love, love when I am able to wear lenses for a long period of time. I would have given it a full five stars, but too bad I received two different batches of these lenses. It's not that noticeable when I wear it, but it does bother me that they don't match up. People will only notice if they are really close to me (like a foot away) and is staring at my eyes. Other than that difference, everything else was pretty perfect in my opinion! These are great lenses for everyday wear and for those that want their eye color to be a different color, but without the enlargement. Thanks klenspop for sending me these to reivew! And thank YOU (my readers) for reading and visiting today. I hoped this review was helpful! You look so pretty and the lenses looking very natural on you *o*!!! I just came across your blog- i think its lovely! i love your hair color! looks great on you also those contacts are amazing! Aw, I'm sorry that happened. I'm sure if you message them, they would be able to replace it for you if it bothered you enough. I have done something similar with other circle lens sites when they sent me the wrong prescription degree (each of my eye have a different degree), and they always send me a new one. You just have to tell the site owner as soon as you get them.